Does anyone else get a little thrill when actual food starts popping up in their gardens? I mean, I have such a black thumb, I don't think I'll ever not be surprised when I see tomatoes on the vine or even my mint surviving another winter. I've unsuccessfully tried to grow zucchini for 3 years in a row, so I scrapped it this year and replaced it with Brussels sprouts. Fingers crossed that's not a fickle plant to deal with and I have a beautiful bounty by the end of the season. One thing I do have success with every year are bell peppers, both red and green alike. Those seem to do the best in my garden and I always end up with so many that I start looking for fun recipes to use them in by the end of summer. There's only so many fajitas a girl can eat, right? I've been saving this Stuffed Red Pepper with Sausage recipe from Golden Blossom Honey for a few months now, but since Fresh Thyme had an awesome sale on red bell peppers recently, I snapped some up so I could try the recipe ahead of my own peppers popping in. What's awesome about this recipe is that it can be assembled earlier in the day, refrigerated, then popped into the oven before serving so this also makes for a fantastic party dish. This can easily be converted to a vegetarian dish by substituting cooked black beans in place of the sausage. I actually used Morningstar Farms Grillers Crumbles in my portion and thought it was exceptionally tasty. Jason, on the other hand, loved having the sausage filled stuffing left as is. Either way, this recipe is definitely a summertime keeper. What fruit or vegetable do you have the most success growing every year? At least some things grow, so you don't have a completely black thumb. Great that it can be ready early and then popped in to have later. This looks like a great recipe and it is good you could be doing it in two sessions and just cook it already made. I never made this but I will have to try soon. Oh my goodness now this sounds like a delicious recipe. I have to admit we like trying out different things with sausage so this is something we could definitely try. THis is something I'd eat everyday if I could. My husband, not so much. It's just so good for ya. I remember having stuffed red peppers for the first time and how happy my palette was. So full of flavor! Yours look like they are full of flavor as well! These peppers look delicious. I woudln't have imagined adding honey, but now it makes sense. These look absolutely delicious. I love that it is good for you and looks like a dish my family would enjoy. Thank you for sharing your recipe. This looks really good! My family loved stuffed peppers! This does look good! I like most stuffed pepper recipes. Nom Nom! I've made something similar to this but I've never added honey. 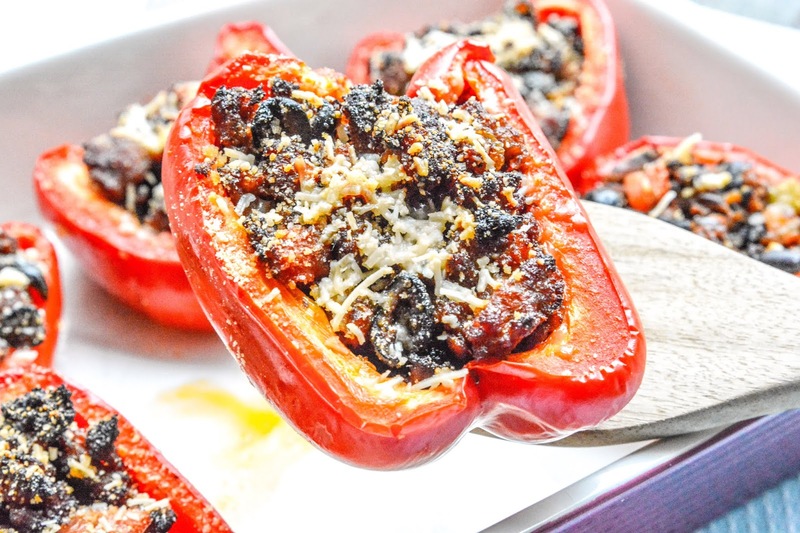 I love stuffed peppers and I think these are pretty awesome. It would be so nice to try this recipe. I think it's perfect as well, for when you're hosting a party. I do like recipes that you can make ahead of time and then just pop in the oven when you get home. 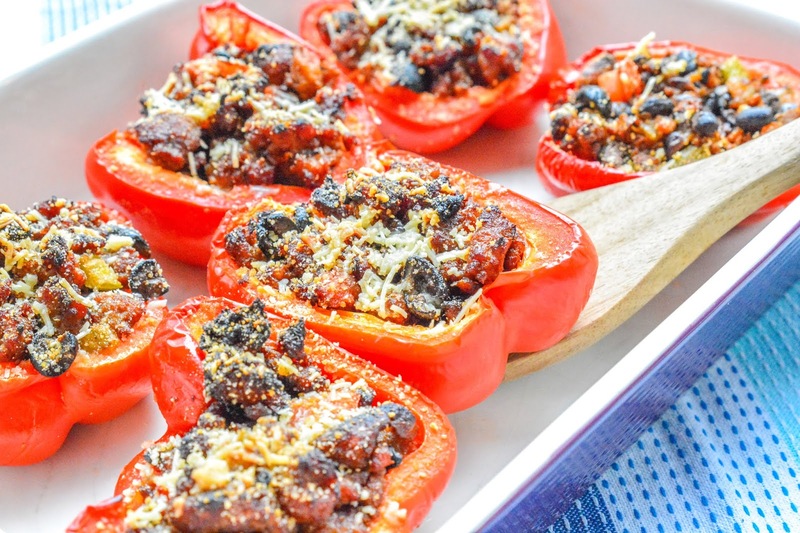 These stuffed peppers look and sound delish!